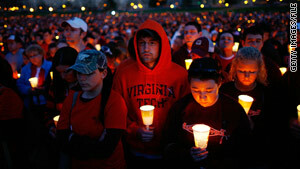 Virginia Tech students take part in a candlelight vigil after the 2007 shootings. Preliminary report says school did not notify students in "timely manner"
School also takes issue with definition of "timely"
(CNN) -- University officials from Virginia Tech on Tuesday disputed a U.S. Department of Education report that found the school in violation of a federal campus security law the day a student killed 32 people in an April 2007 shooting rampage. The preliminary report says the school did not notify students in a "timely manner" -- as dictated by the Clery Act -- of a dorm-room shooting that left two people dead on the morning of April 16. The shooter, identified as 23-year-old Cho Seung-Hui, went to the university's Norris Hall more than two hours later and killed 30 more people before turning the gun on himself. The Clery Act was created in 1990 in memory of 19-year-old Jeanne Ann Clery, who was raped and killed after having been asleep in her dorm room at Lehigh University. The law requires colleges and universities to disclose information about crimes on or near their campuses. In a statement, the university said it "strongly objects" to the report's preliminary conclusions. "Virginia Tech professionals acted appropriately in their response to the tragic events of April 16, 2007, based on the best information then available to them," the university's response said. "Prior to the Norris Hall shootings, all the evidence indicated that a crime of targeted violence had occurred and there was not an ongoing threat," the university said. "This was not the conclusion of one police department, but three independent agencies." The university also took issue with the definition of "timely" put forward by the Department of Education and the Clery Act but notes that "DOE's compliance guidelines illustrate 48 hours as an acceptable timely notification procedure." The bodies of the dorm shooting victims were found at 7:24 a.m. April 16. The university first notified students and staff by e-mail of a shooting on campus at 9:26 a.m., according to the report. About 20 minutes after the e-mail went out, Cho opened fire in Norris Hall. The university also took issue with a number of "factual errors" in the Department of Education report and said the report holds the school accountable to "standards that did not exist at the time or ... to a new Clery Act standard that was developed after -- and in response to -- the tragic events that took place on our campus." The school has been criticized in the past for what some have called a slow response time to the first report of a campus shooting. A report issued by Virginia's governor in December found that university officials had begun to lock down administrative buildings and some staffers even warned their families that a gunman was on the loose nearly 90 minutes before the rest of campus was notified.